Mobility problems are extremely common among elderly adults. The lingering effects of injuries, stiffness and pain associated with arthritis, balance problems, dizziness, and other issues can all contribute to your parent having greater difficulty navigating their home, or other surroundings. Not only can this be frustrating for them, but it can also diminish their activity levels, health, and even quality of life. One simple but highly effective way of helping your parent cope with these issues is by finding them a mobility aid. 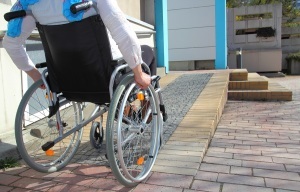 There are many different mobility aids available, and it is important to find the one that is best for your parent. Height, weight, particular mobility issues, and other factors all contribute to the effectiveness and benefit of each type of mobility aid. Helping your parent find the best one for them can be a valuable step in encouraging them to be more active, stay safer and more independent, and enjoy a higher quality of life as they age in place. * Talk to their doctor about your parent’s specific challenges and needs so they can give recommendations for how best to address them. You may find that your parent has specific issues that make certain aids inappropriate. * Go to a medical supply shop to talk to the professionals about your parent’s needs. Not only can they give recommendations for different types of aids, but they can help your parent try out different options to find ones that feel right to them. * Consider the different types of activities your parent does, and use that to gauge the aid that might be right for them. A senior who is staying at home most of the time, for example, will likely need a different aid than one who is going to be very active and heading out into the community regularly. * Encourage your parent to consider more than one type of aid. They may find that one is more appropriate for some activities, and another is better for others. This gives them more flexibility and confidence in staying active and engaged. Helping your parent cope with mobility issues is just one way a home care provider can improve their quality of life. If your aging parent struggles with mobility issues such as balance problems, stiffness or pain in the joints, muscle weakness, or other problems that make it difficult for them to move around safely and confidently, it can have a tremendous impact on their function and quality of life. A home care services provider can help your aging parent cope with these challenges in ways that encourage them to stay active, utilize their home safely and comfortably, and enjoy better mental, emotional, and physical health and well-being as they age. For Home Care Services in Arlington TN, please contact the caring staff at Personal Care Services MidSouth today! This entry was posted in Home Care Arlington TN, Safety at Home and tagged Home Care Arlington TN. Bookmark the permalink.